Well it seems Piriform put a little surprise in version 5.55 of CCleaner. It's an Updater. It tells you if any of your programs need updating and offers to do it for you. Now the catch that they don't tell you is once you click on the link to see what program is out of date, a box opens up... and tells you how much you have to PAY for the Updater Program. And the box won't close until you click on the link to start the payment process. Isn't that a load of crap!? I can't figure out how to close the box and get back to the CCleaner, so I just did a hard reboot, shut my computer down and restarted it. I can't believe Piriform has stooped to this level. I am not against working people trying to make a profit. Cool. The problem I personally (I write it that way because I am one person and nobody special in this regard) have is taking an application that is supposed to clean stuff and making it install stuff. No man. That's not how this thing works. I know. I have been using it for a long time. In other words, this thing is not intended to be monetized and any effort is harmful to it. The message box you are describing has a 'No Thanks' option in the bottom left-hand side, as seen in the screen picture below. This will close the message and cancel the software update. If you are not seeing this option please let me know and provide a screenshot if possible. So CCleaner has now become another example of Crippleware. Crippleware - You get halfway through using a feature and then get prompted to buy to finish using it. If it's not available for Free then disable it altogether, like the other Pro features. Piriform are once again not doing themselves any favours and alienating their existing userbase. There are already plenty of complaints about this new updater on the forum - mostly that it doesn't even work in the Pro version and keeps reporting a connection error. I took a look at it and this reported error is related to accessing the internet. It can easily be replicated by putting your computer into 'Flight Mode' and so disconnecting from the net. I suspect that in most cases it's firewall settings that are preventing CCleaner from accessing the net. I'm aware that many users have blocked CCleaner in their firewalls, or it may be AV settings that's blocking the Updater from accessing the net. I'm deeply sorry, but whenever I open my CCleaner and click the "Refresh" button, nothing happens. Who in there right mind would want Ccleaner/Piraform to update there computer? This should be done from Microsoft. This IS done by Microsoft. We PC users have issues with updates as it is. Updates for motherboard drivers should be done from the company the motherboard is made.. ASUS, Gigabyte etc. NOT ccleaner. Microsoft notifies you of Microsoft approved updated drivers. WHY WOULD ANYONE want to start to trust a 3rd party like Piraform via Ccleaner to do this? The first thing needs to be considered here is this... pop ups. 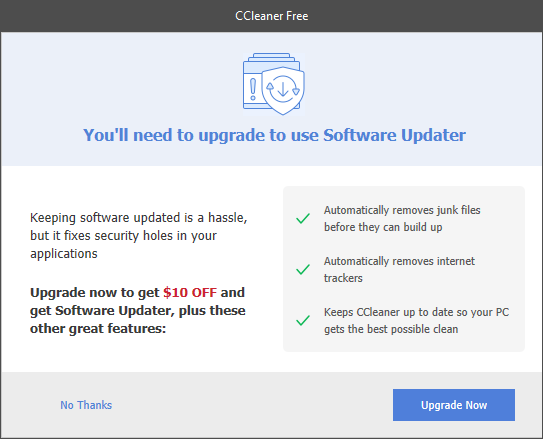 Ccleaner has pop ups to upgrade, once you upgrade the pop ups are still not stopping. The features your upgrading for are not showing up. The 'within 4 hrs ' of customer service has been reported to not be correct. Why the hell would you let Ccleaner check for updates or update or have anything to do with updates for your PC?? "Keeping software updated is a hassle, but it fixes security holes in your applications"
Ccleaner is a security hole. Everytime I scan a version over on VirusTotal, there is always some positive. Some toolbar, some weird web address.. something. Even posting in the forums here, threads get closed. Even this website has issues.